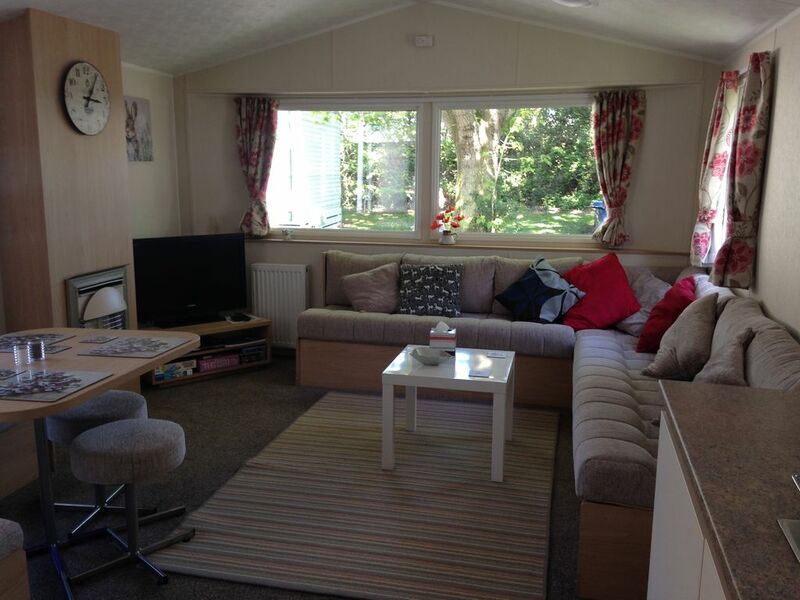 This spacious two bed static caravan sleeps 6 (plus there is a travel cot for babies and young toddlers), located in the 5 star Shorefield country park. Property has veranda and is in a peaceful picturesque part of the park. The caravan is clean modern and comfortable, includes microwave, DVD player,TV and Wifi, it is well stocked and has a homely feel. Access to Shorefields indoor and outdoor (summer season only) pools, passes and pricing for these can be obtained through Shorefield park reception. It is a five minute walk to the local beach and a fifteen minute drive to the heart of the new forest. There are plenty of things to do locally and Shorefield reception has information on all the local attractions and activities. The Caravan has central heating and a radiator in each room, temperature can be set on the boiler. Passes to use Shorefiled's indoor and outdoor pools can be obtained form reception, different pricing options are available depending on use required. Great caravan, with everything you need, and in fantastic surroundings. Ideally situated for coastline and forest. We were visiting family and this was a far better option than staying in a hotel. Would definitely stay again! We had a lovely stay at this place. The lodge had everythjng we needed and the park was lovely. Anya the owner gave us all the instructions needed and answered any queries very quickly. We would definitely book again! Anya was a great host, very friendly and flexible on check out times! The caravan was very clean and our children enjoyed the child friendly touches like toys and DVDs. Lovely family caravan in a quiet spot. Very roomy caravan. Well equipped kitchen and children's toys and books. Good quiet pitch backing on to woods. Lovely homey feel, much more space than we expected, really well presented, heating was amazing and shower fab! I’m a nice quiet spot in the caravan park. We really enjoyed it!